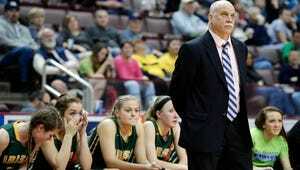 HERSHEY - York Catholic girls' basketball coach Kevin Bankos was frank after Thursday night’s loss in the District 3 Class AA championship game. “All streaks are broken,” he told reporters outside the locker room. For the Fighting Irish, that streak lasted for a decade. Former head coach Andy Bria started it in 2006, and Bankos kept it going. Every year for 10 seasons, the district tournament ended with York Catholic hoisting the trophy — until the run ended in Thursday's 54-40 loss to top-seeded Camp Hill at Giant Center. 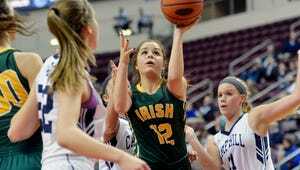 Although the Irish failed in their bid for their 11th consecutive district title, they already made their mark in girls’ basketball long before Thursday night. Their 10 straight titles are the most any team has won consecutively in the district, male or female, and it is a feat that has made the administration at York Catholic proud. To further accentuate just how long this streak has run, just look at how much the world and team have changed since York Catholic's 2006 district title. Facebook was just becoming popular, Twitter was just launching, Daniel Powter’s “Bad Day” was blaring on the radio, and the Pittsburgh Steelers had just won a super bowl. Through all the change that would occur around the program, the Fighting Irish found a way to win consistently. The Irish have three players graduating after this season ends. Emily Laslo, Kiersten Reed and Danielle Desseyen will all get to say they had the chance to play on the Giant Center court all four years they played basketball. And Bankos pointed out that streak or no streak, that's an accomplishment that few athletes can own.